About a month ago a friend told me about a bar in Honolulu that served nachos made with tater tots instead of tortilla chips. “You can eat those, can’t you?” he asked. Of course, there’s never a simple answer to that question when you have Celiac, but my interest was piqued and I decided to make a version at home. I never anticipated blogging about them because really, how good could they be? Wouldn’t I have heard of them before? I guess not. 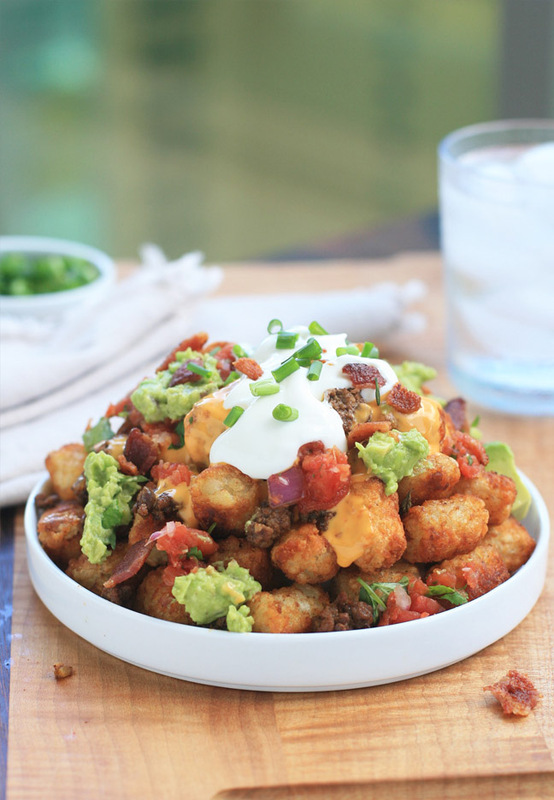 I’m now wondering how I made it thirty plus years without tater tot nachos, or totchos, in my life. Perhaps the food blogs that I frequent are too healthy? I decided that even though this isn’t my normal type of post/recipe, it was my civic duty to help spread the word. It took me a couple weeks to remember to pick up the ingredients and take photos, but here they are, in all of their cheesy, beefy glory. 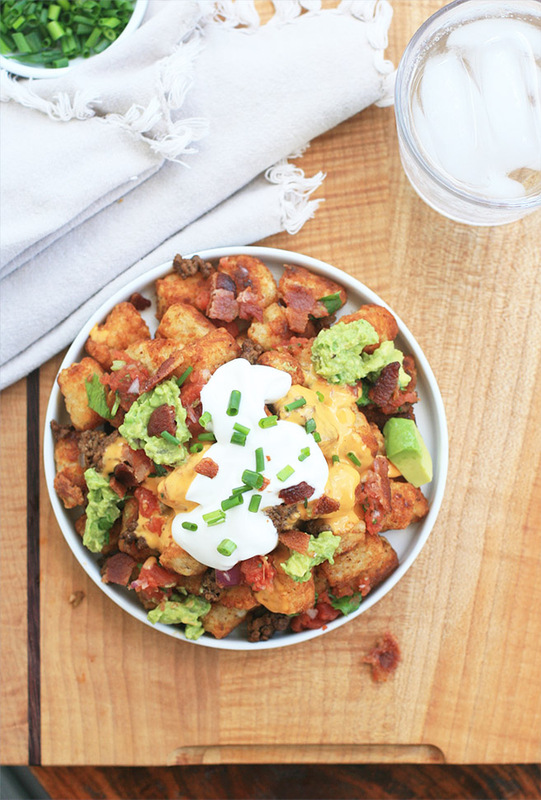 Tater tots are baked until super crispy and then topped with seasoned beef, cheese sauce, salsa, guacamole, sour cream, green onion and crumbled bacon. And although I can’t believe I’m actually saying this, you’re probably going to want to go with that prepared cheese sauce you buy from the supermarket for these. It’s pure junk food heaven. 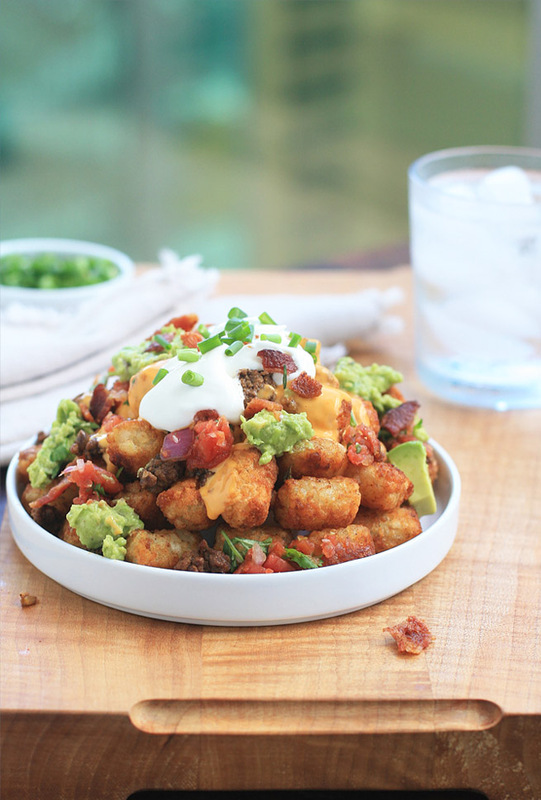 If you’re able to show more restraint than I am, you can also go with this slightly healthier version that Julie posted, coincidentally, the week after I’d had eaten totchos for the first time. I’m psyched that the word is spreading. Note: I wrote the recipe to make extra of the ground beef, since I like to use the leftovers for tacos. If you’re not interested in making extra seasoned beef, you can reduce those ingredients (onion, garlic, beef and spices) by half. Prepare the tater tots using the oven method instructions on the package. Err on the side of overbaking because you’ll be adding a lot of wet toppings, and you want the tots to remain as crunchy as possible. While the tater tots are baking, fry the bacon until crisp in a large frying pan. Remove and set aside to cool. Ladle out all but about 1 Tablespoon of the bacon grease. Add the onion and garlic to the frying pan and cook over medium heat until softened. Add the beef and stir to mix. Once the beef is no longer pink, add the chili powder, cumin, paprika, cayenne pepper, oregano, salt and pepper. Stir to incorporate and then cook several additional minutes until the flavors have melded and the meat is cooked through. 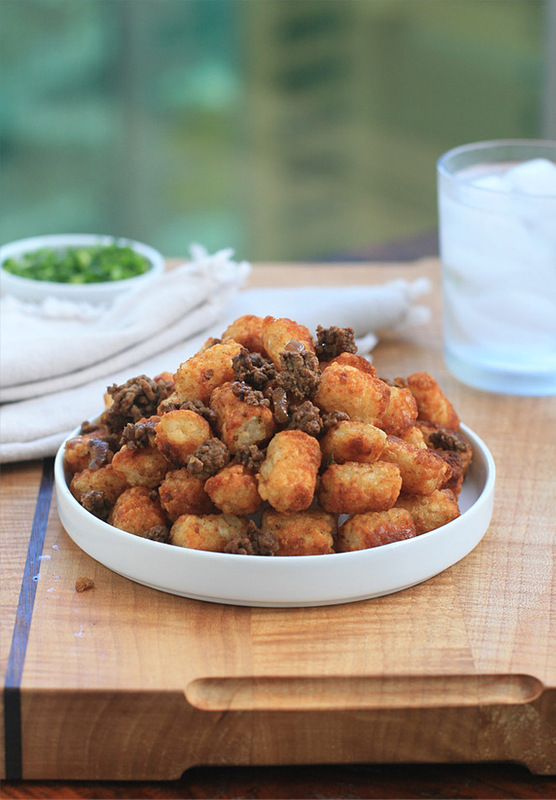 Once the tater tots have finished baking, use tongs or a spoon to transfer to a large platter or individual plates. Top with the seasoned beef, salsa con queso, salsa, guacamole, sour cream and green onions. Crumble the bacon over the top and serve immediately.